I’ll be starting a series of posts on one of my passions and hobbies, Hardanger Embroidery. Anyone who has ever wanted to learn Hardanger, or “cut-work” as it’s often called in the U.S., can follow along with the instruction. In a few weeks, I’ll start posting pieces of a pattern I’ve created for a stitch-along. It should be a lot of fun! To the left is a sample of some of my work – I created a “name plate” for my daughter, which I turned into an applique for a pillow. 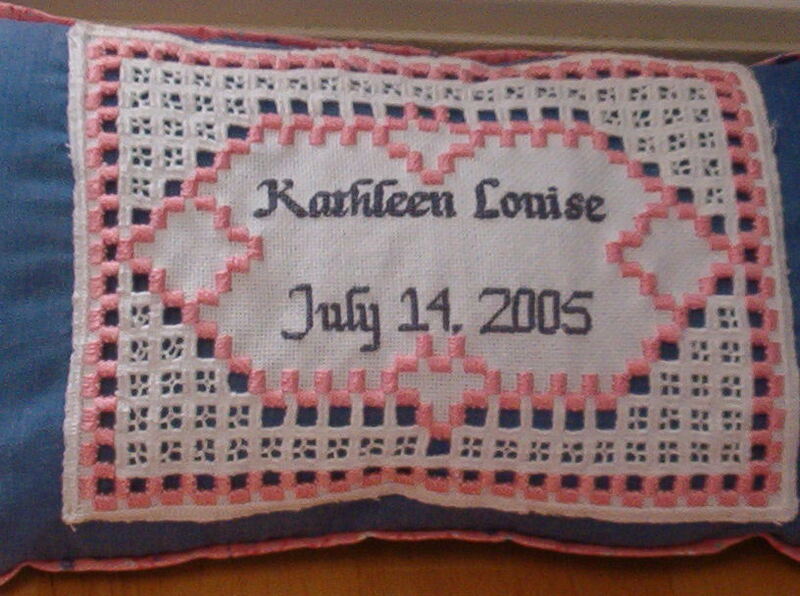 The Hardanger work is the pink satin stitches, the cutwork, and of course the weaving in the spaces. The name is straight-up cross stitch! The pattern for the stitch-along will have a lot of room for personal expression, and will not have such large blocks of cutwork. This one was ambitious for someone who had only been doing Hardanger for about 3 months (at the time)! Blogging – a new adventure!